Several members of NVNTRAK, the largest NTRAK club in the US, have proposed and built oNeTRAK, a new modular subdivision of NTRAK featuring a single track mainline and Digital Command and Control. The objective of oNeTRAK is to augment and expand NTRAK to allow prototypical modeling and operations on a single track modular railroad. oNeTRAK offers modular railroaders the opportunity to build smaller, less expensive and easier to transport modules. Because they are smaller than NTRAK modules they provide more mainline per unit weight yet still have a high scenery to track ratio. They are easier to incorporate into home layouts. A wider variety of prototypes locations are available to model. Except for the inclusion of just one mainline, the oNeTRAK modules follow NTRAK specifications. For example the track center line must be located between four to seven inches from the module front with the top of the rail 40 inches from the floor, the same as NTRAK. Electrical connections are the same as NTRAK utilizing the standard Cinch-Jones plug-in connectors but with two fewer sets of plugs. Thus, oNeTRAK modules are compatible with NTRAK modules. In fact NTRAK modules can be used to fill out the oNeTRAK subdivision and in some cases oNeTRAK modules can fill in an NTRAK layout such as on the spine of a multiple loop layout. oNeTRAK layouts can be configured in ovals, point-to-point (using existing NTRAK yards at the terminals), or by utilizing junction modules, as a branch off a NTRAK loop. oNeTRAK modules, by virtue of their lower track density, can be smaller than NTRAK modules and still have sufficient space for a convincing scene. Straight modules have a minimum width of one foot. Many of our oNeTRAK modules are just one by four feet, a very portable size. We have found one foot wide modules to be not as stable as two foot wide modules, but when clamped together, the whole layout is very sturdy. Corner modules can also be smaller. We have built oNeTRAK corner modules as small as two feet by two feet but recommend slightly larger dimensions of at least two feet six inches by two feet six inches to allow room for track easements and the 18 inch minimun radius curves. Conventional NTRAK corners can also work in a oNeTRAK layout. Design options are nearly unlimited. We have built modules with offsets, curves, industrial tracks and some with double track to create long passing sections. We have also built portable end loops to allow the oNeTRAK layout to be set up with modules back to back. By utilizing DCC we can increase the density of our train operations on the single track, have realistic operations and simplified wiring. Analog (non-DCC equipped) locomotives are not excluded from the oNeTRAK subdivision since DCC allows one analog consist to run along with nearly unlimited DCC consists. We currently use a tethered DCC system but anticipate switching to radio DCC as soon as possible. Realistic operations on the oNeTRAK subdivision requires passing sidings long enough to hold an entire train. We have made effective passing sidings by placing a matched set of turnouts on each of two one by four feet modules. The resulting one by eight foot module set can house a double track passing siding about six and half feet long, enough to hold two engines, 18 cars and a caboose. The operating scheme is tailored to the situation. For realistic operating sessions we employ a dispatcher, yardmaster and several train crews. For display at shows we merely use the subdivision as a display loop in conjunction with the rest of the NTRAK layout. We are also considering other advanced operation schemes including grades with helper districts, waybills and car forwarding. oNeTRAK is an NTRAK compatible single-track branch line that can augment NTRAK layouts. Light weight, simple to build modules, especially for beginners or those with limited transport capability. Provide an alternative to three track modules that can be connected to an NTRAK layout. Connected layouts encourage team building and enhance fun! Provide a branch line for more prototypical operations. Most of these guidelines are based on NTRAK standards. HEIGHT OF TRACK Nominal 40 inches, plus or minus for grades. FRAME SIZES Frame lengths in multiples of one foot. Twelve inches are the minimum width. This width may be increased up to one foot, front or back for a total maximum width of three feet. TRACKS Code 80 track is standard. Code 55 is acceptable with code 80 transitions at module interface. Any Atlas, Peco or Micro Engineering code 80 or code 55 turnouts are acceptable. One track is required, additional through tracks are permitted. MINIMUM RADIUS is 18 inches with appropriate easements. To prevent binding the minimum length of tangent between all reverse curves must be 5 inches. LOCATION OF TRACK On straight modules the location of the main has no impact on the loop of modules and is not important, but generally the track is set back 4 or 6 inches from the nominal front so that the Fascia may be reasonably aligned. Bump outs on the modules are permitted, same as NTRAK. Double or triple track should have 1.5-inch center spacing at the module interface. CORNERS Standard corners can be 30 by 30 inches, 3 by 3 or 4 by 4 feet, etc. On a standard comer the track should be set back 6 inches from the nominal front edge. This makes layout design with inside corners easier. On a 30 by 30 inch comer there is ample room for the 18-inch radius curve and easements. CLOSING LOOP LAYOUTS Due to the wide variety of frame sizes and locations of tracks, some gaps may develop in a loop layout. Most large loops should be flexible enough to close a gap by "scrunching" the modules together. In some cases a temporary bridge may be necessary. This can be made by using a piece of foam, some flex track and a bar clamp to close the gap. JUNCTIONS The smallest recommended junction is 3 by 4 feet. GRADES 1.5 percent maximum across a dedicated set of modules. Grades on other modules can be created with shims under legs of modules. Grades suggest addition of a helper district and helper engine facility. END TURNS are modules that include a 180-degree curve in the track. They should be a minimum of 3 by 4 feet to allow the 18-inch minimum radius and easements. The distance between the ends of tracks on an end turn must be three feet or more in even foot increments. TURNOUT SIZES All turnouts should be number 6 or larger on the mains, passing sidings and interchange tracks. Number 6 turnouts are also encouraged in yards for better operation. ELECTRICAL The main line has a red plug fastened the same way as NTRAK. The white and 110 volt requirements are the same as NTRAK. There are no special DCC related wiring requirements. NTRAK standards for wire gauge suffice. SCENERY Any realistic scenery is permitted. Round down hills on the ends of modules so the view from an adjacent flat module looks like scenery. Colors for the fascia and skirts should blend with the scenery (generally shades of green or brown). Do not use diorama dividers. SKYLINE Skyboards or vertical scenery flats are optional. 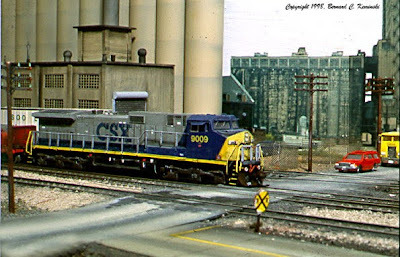 PASSING SIDINGS To enhance operations most layouts should include several passing sidings. Clubs should try to include one or more standard passing sidings in a layout. A standard passing siding is a set of two 1 by 4 feet modules with turnouts at each end of the pair and double track connecting the turnouts. The resulting passing siding is about seven feet long. Double or triple track modules can be used to extend these sidings. OFFSET MODULES provide track offsets in one-foot increments for visual variety. Observe 18-inch minimum radius and tangent track between reverse curves standards. OPERATIONS SCHEME Although a stated purpose of oNeTRAK is to provide a venue for more prototypical operations, no operational scheme is specified. Clubs and individuals can tailor the operating scheme to their situation. To increase potential for realistic operation, wireless DCC is recommended. LAYOUT DESIGN oNeTRAK modules have proven very flexible in layout design both as part of a NTRAK layout or when standing alone. Note that NTRAK modules can be used in a 1T layout. The price for the oNeTRAK spec sheet from NTRAK publishing is $1.00 and an SASE, not the $0.25 and a SASE listed in the article. Second paragraph down, left column. the word "inner" should be "outer." Title to Figure 3, the word "Loop" should be "Branch". In Figure 3, the NTRAK module connecting the NTRAK yard to the yellow oNeTRAK corner should have crossovers from the red to yellow and yellow to blue to allow access to the yard tracks.